Instead of writing Password123 eggPlant is writing password!123. So there are 2 problems. Is your SUT a Mac running Vine Server? If so, then you need to open the Vine Server preferences and under the Advanced tab set the Event Source dropdown to "10.3 API (No Source)" and the Keyboard Events to "Hardware Events". If not, then we need a lot more information on your configuration on both sides of the connection. No my SUT is an Android device and I am writing a script to log on to twitter that opens in a web view from my app. As passwords are case sensitive so I want it to write exactly what I am passing in TypeText command. If you are working against DroidVNC then it would appear that there might be an issue with that server (although we've not observed it). If you are working with the RealVNC Mobile server then we need more information about which version and which device you are working with. 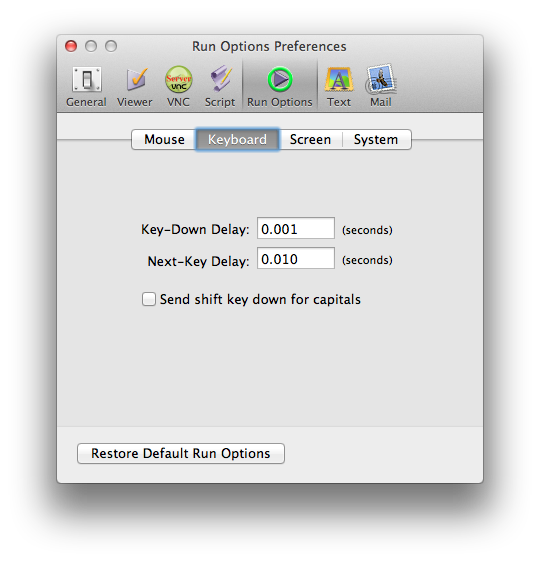 One suggestion is to try disabling the "Send Shift Key for caps" setting in the preferences. As shown in the image.